You can rely on us to support all aspects of your sales and business development effort, ranging from social media content and marketing communication to regional or national sales meetings or special events. We all depend on various forms of written business communication to get our message across to clients, prospects, and staff; and you can depend on us to deliver professional, on-time solutions. We can help with social media or blog content, sales letters and email templates, and all forms of marketing material. You can also count on us to go well beyond "just" the writing. Thorough research into each client's unique characteristics enables us to incorporate their brand and related key factors into all written material. Should you have an interest in exploring more in-depth ideas, we are well-experienced at handling specialty projects such as corporate profiles, annual reports, white papers, and book projects. 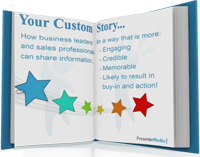 Stories can be an incredibly powerful way to get a message across and to more fully-engage an audience during the business development or selling processes, or as part of your leadership effort. Let's face it, most people would rather read or listen to a good story than a good sales pitch or a lecture! Let us help you write your stories... possibly in smaller-sized pieces that can be used in presentations, as web-site case studies or promotional handouts. By following six critical guidelines we can help you craft compelling, relevant summaries of how your organization provides value.